Basseterre, St. Kitts – Cooking, football, airbrushing, cosmetology, painting, marching band, and arts and crafts are among the 13 disciplines taught at the 34th Annual Summer Residential Camp to offer participants diverse and educational programming in a fun-filled and safe environment. 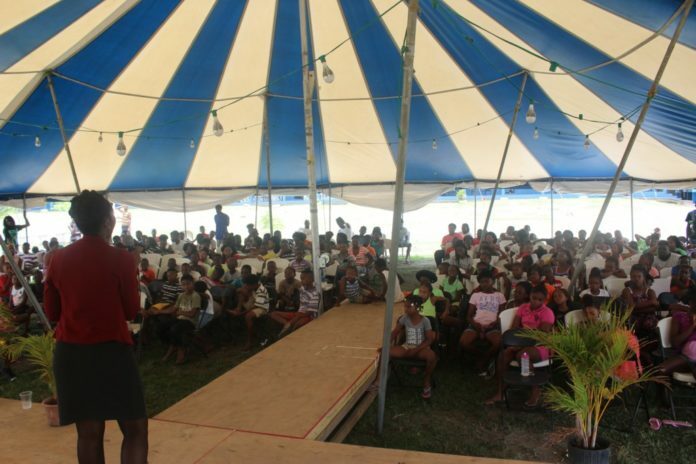 The yearly camp is among the top summer initiatives on St. Kitts for children ages 8-12. The addition of dance, traditional drumming, music and disaster management to the July 16-30 camp completes the list. Organizers at the Department of Youth Empowerment said that the training offered is in keeping with the interest of the target population and is designed to enhance their development. Youth Officer Kristen Hendrickson puts together the programme and recruits the facilitators. She noted that there are two separate classes for dance and arts and crafts. For the latter, the facilitator will showcase tie dye, face painting and costume design and making techniques, while the second will review corsage making, wreath making and decorating. Some of the camp participants have gone on to use the newly acquired skill as a way to generate monies. Hendrickson recalled one such instance where a camper was recruited to produce corsages for a private job. The camper was able to contact the facilitator, who willingly offered advice and supported the young woman in meeting the requirements of the job. Additionally, campers who participated in the marching band sessions can be seen regularly during street parades with different groups. The youth officer said that there is an exciting programme of complementary activities including sessions in social skills, safety, crime prevention, entrepreneurship, teamwork, accountability and creative thinking and expression that will help to promote the positive development of the young people.